Locations for pick up for 2:30 appointments during the school year? Fairfield Warde High School students will be picked up at the James Blake Tennis courts. Fairfield Ludlowe High students will be picked up in the Teacher's parking lot under the Weekly Sport Calendar. Staples High School students will be picked up in front of the Field House. Fairfield Prep students will be picked up at the main entrance of the school near the guard house. Notre Dame High School students will be picked up at the same location that the buses depart. during the time lessons are being scheduled. Can I start the Teen Drivers Course before I am 16? No, you must be 16 years of age to attend the class. Do I need a learner's permit to attend class? No, you don't need your permit to attend the class. You will, however, need your permit when you begin your Behind­ the­ Wheel lessons. The 30­hour course is divided into 15 two­ hour classes. No, you do not need to attend the classes in any particular order. For your convenience, you can pick and choose as you go. Just make sure you complete all 8 of the Black classes, 5 of the Red, and you can choose 2 of the Green ​classes of your choice. Once you have registered and paid for the program, the only class that requires a sign­up before­hand is the Parent Class, however walkin's are accepted. 16 and 17­ year ­old students may attend up to four hours of classes per day when school is not in session (week­ends, summer, school holidays). On school days, students may only take a two­ hour class. With this said students may attend a Behind­ the­ Wheel lesson and class on the same day during the school year. For students 18­ years of age and older, there is no restriction on the number of class hours per day. Contact the office manager to determine if you qualify for a refund. Can I attend more than one class per day for the 8-Hour Course? 16 and 17­ year­ old students may attend up to four hours of classes per day when school is not in session (week­ends, summer, school holidays). On school days, students may only take a two­ hour class. 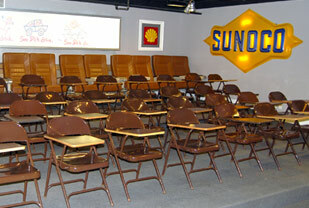 With this said students may attend a Behind­ the­ Wheel lesson and class on the same day during the school year. For students 18 ­years of age and older, there is no restriction on the number of class hours per day. I just turned 18 do I need to get a Learner's Permit? Yes, a learner's Permit is required for all new drivers. Who should attend the 8-Hour Safe Driving Course? Any new driver who wants to get a license six or more months after receiving their permit. We offer the 8­Hour Class form 16 through adults. Students who attend the 30­hour course should be eligible to receive a discount from their insurance carrier. Typically, this discount is not available to students who take the 8­Hour Course. Check with your insurance carrier to confirm. Do I need to attend the parent class with a parent? Yes, all students under the age of 18 are required to attend te Parent class with a parent. Can I start the course before I am 16? Do I need a learner's permit to attend course? No, you don't need your permit to attend the class. Permit is only required for you to schedule your Behind­ the­ Wheel lesson. How many classes make up the 8-Hour Course? The 8-­Hour course is divided up into 4 classes two days, Sat./Sun. from 12:30­5pm. Parent/Student class which are held twice a month on Thursday evenings from 6:30­ - 8:30. Do I need to sign up in advance for each class that I want to attend for the 8-Hour Course? No, you don't need to sign up for each class session in advance. Pick and choose the class times that work best for you. Who is eligible to take the Road Exam at The Driving School of Fairfield? held their permit for at least four months. their permit for at least six months. ❏ Any 18/19 year ­old driver who has completed the 8­Hour Course with us, completed at least one 2hr Behind­the­Wheel lesson with us and has held their permit for at least three months. Do I use my own car for the test? Does my parent need to be with me for the test? No, your parent will fill out all of the necessary paperwork before your test date. They do not need to be at the facility on your test date. We can accommodate up to 15 students per test day, and advance signup is required. We schedule three time frames per test day. 5 students per hour 8am, 9am, 10am(Student test times are booked on a first come/first serve basis.) The test itself takes about 15 minutes and is conducted on roads within a three mile vicinity of our facility. If I pass, when do I get my actual license? Road Test at our facility. You can take the test again as soon as two weeks later.